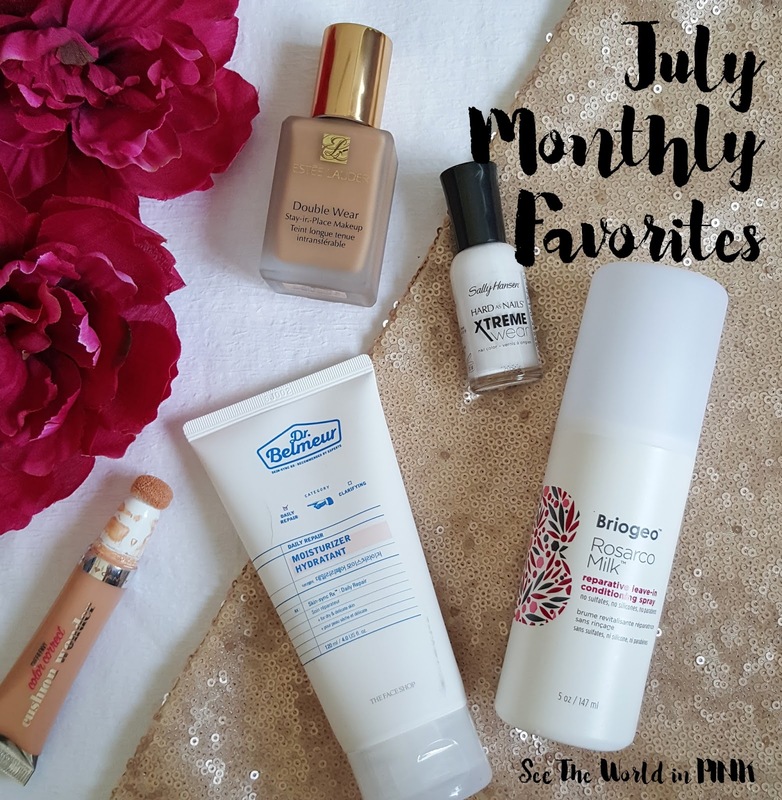 Here are the 5 things I have been loving for July! Estée Lauder Double Wear Stay-in-Place Makeup ~ $48.00. A 24-hour, flawless foundation that stays looking fresh and natural through heat, humidity, and nonstop activity. So, my usual Summer go-to look does not include a heavy or full-coverage makeup look, but if you need this type of look in the Summer months (weddings, events, blemishes to cover) then look no further! I went to a crazy hot wedding outside and this did not budge! I have worn it when I know i'm going out for a while and it is fantastic! Offers great coverage and lasts all day in all types of weather! Sally Hansen Xtreme Wear Nail Polish - White On ~ $3.99 (price may vary). Bioactive Glass bonds to nail proteins to give a hard manicure that lasts up to 7 days! It's no secret I use Sally Hansen polishes in almost all my manis - and honestly, these are some of my favorite polishes. The easily outlast many expensive ones and have great coverage (I often only need 1 coat in a lot of their shades). White On has been my go-to white for years and I have used it a lot recently. It's one of the only polishes I go through regularly and am always impressed with it's wear! I raved about this concealer in my review about the Spring/Summer Hard Candy line - I have been looking for a peach concealer to use under my eyes to help brighten them! This is the best color correcting concealer I have tried! It really works to hide the blue/purple under my eyes if i'm looking tired. The cushion makes for a gentle application and this works so well - doesn't crease. Love it! I love moisturizers that are light, gel texture for the Summer! This is so smooth and soft and really does the trick! It is light on the skin, but still moisturizers enough for my dry skin. I also love that this is made without: "9 additives: parabens, synthetic pigments, triethanolamine, mineral oil, benzophenone-3, animal-derived ingredients, propylene glycol, talc, benzoic acid. Allergen-free fragrance: formulated without 26 types of additives with possible allergens." I have never repurchased a hair product until now! I received a sample of this quite a long time ago, and I wasn't sold until I bought a cheaper hair milk thinking it would do the same thing (it didn't). I love this product so much for my hair - which can be dry and frizzy, but also very fine so it needs a light but effective product! This works amazing and smells so good! I've been looking for another drug store colour corrector! I haven't seen the Hard Candy one before! I really don't like the Physician's Formula one I am using. I haven't found many color correctors I like overall, I find most too thick! I loved this one and have heard good things about Maybelline too. I've been loving that Dr. Belmeur moisturizer too!